The official research publication of the University of San Jose-Recoletos (USJ-R) was hailed as the first Cebu-based academic journal recognized by the ASEAN Citation Index (ACI) last November. 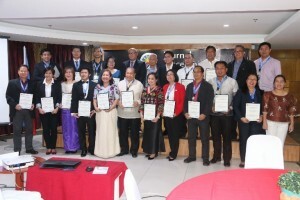 Recoletos Multidisciplinary Research Journal (RMRJ) came out as one of the 9 journals throughout the country that passed the critical eye of the ACI steering committee in an evaluation made in Singapore last month. ACI is a central regional database set-up to index all the bibliographic records and the citations from scholarly journals. The RMRJ of USJ-R is the only one in Cebu to have gotten this recognition by far. 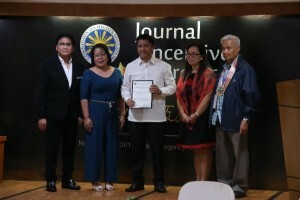 This is the journal’s second recognition this year after it was chosen as the only one in Cebu to be granted the Journal Incentive Program (JIP) by the Philippines’ Commission on Higher Education along with journals from major universities in Manila. University President Rev. Fr. Cristopher Maspara, OAR (center) receives the ACI recognition from the Commission on Higher Education, together with Dr. Napoleon Juanillo, Jr., Dr. Agnes Sequino, Dr. Jessica Avenido and Dr. Angel Alcala. The University’s Center for Policy, Research and Development Studies (CPRDS) is the one in-charge with RMRJ. Journal management division head, Dr. Jessica Magallon – Avenido, disclosed that the two major criteria met by the Recoletos publication are timeliness and quality of contents. “The articles submitted to us by contributors undergo double-blind review which means that the reviewer won’t know the owner of the paper for review and the reviews are at least three results coming from experts both foreign and local,” Avenido said. A check on RMRJ’s editorial board would reveal that its associate editors are from various universities overseas, particularly in North America, Asia, and Africa. As to its articles, the RMRJ has a good mix of papers coming from external researchers and only a handful from USJ-R. Other criteria used in the evaluation process by the ACI committee are that the journal’s age must be at least 3 years or at least has released 6 issues; citations in national and/or international databases; good diversity of authorship; good diversity in editorial board members; clarity of concepts and policy; uniformity of formats; presence of an updated and comprehensive website; and online submission capability. “To improve the quality of our research outputs and even our professions, we need to do cross fertilization by interacting with other professionals in our disciplines,” said CPRDS Head Dr. Agnes Cinco-Sequiño. The representatives of the universities which qualified for the CHED Incentive Program pose together after the “Night of Excellence”. CPRDS also has its Intellectual Technology Support Office (ITSO) which is a franchise from the Intellectual Property Office (IPO) of the Philippines. It can help both external and internal clients in applying or searching for patents and even copyright application for a minimal administrative cost. With this in mind, USJ-R utilizes some of the best software used for research production including the existence of an Ethics Review Board, Institutional Research Council, and agreement with government agencies and similar organizations that can help assure the good quality of the center’s research outputs. Through the said office, the University has been helping Cebu Chamber of Commerce on some patent processing and other related concerns. Sequiño also said that USJ-R is ready to accept commissioned research or requests from companies or other entities. In fact, CPRDS has an existing research engagement in two parts with a big non-government organization.